The new price-focused Fiat Tipo Hatchback is a well-rounded family car that offers plenty of practicality for everyday situations. It’s cheap to buy and run – but it isn’t without its faults. Indeed, one of the most unappealing aspects of the Tipo is its dull driving experience. It’s also not quite as big as some rivals and can’t offer as much boot space. For many buyers, however, its low price tag will allow them to overlook its shortcomings. OSV takes a closer look at what it’s all about with our 2018 Fiat Tipo Hatchback review. On the road, the Tipo is able to offer a relaxed driving position. Its soft suspension setup means that it’s comfortable for the most part – but this focus on comfort ultimately means the car isn’t as entertaining as some of its rivals. Body lean is a bit of an issue if you take bends with too much enthusiasm, and while light steering makes sense in the city, it’s too light (and vague) out on the open road. That said, the Tipo isn’t a bad car to drive per say. It’s just that it doesn’t offer any excitement whatsoever, and this could prove to be a major turn off for some buyers. The real issue is that the Tipo lacks the kind of flair and character that we’re so used to seeing from Italian cars. There are a few pros too, of course. The steering is well-weighted and ride quality is decent. The chassis, moreover, does a decent job of smoothing out most road surfaces. In terms of its engines, there are three petrols to take your pick from. A turbocharged 1.4-litre petrol develops a healthy 118bhp, which makes it the most powerful in the range. It’s quick and can get you from rest to 62mph in 9.6 seconds, but the caveat is that it’s also expensive. A smaller 1.4-litre non-turbocharged petrol engine develops a modest 94bhp and covers the 0-62 dash in 12.1 seconds. Both these petrols come with a 6-speed manual ‘box as standard and can’t be specified with an automatic. Rounding off the range is a 1.6-litre petrol engine that produces 109bhp and can cover the 0-62 sprint in 11.5 seconds. The Tipo might be price-focused but it’s still a fairly stylish car to look at. It’s also not too shabby inside. Not too shabby is a bit of a backhanded compliment and compared to rivals the quality of the materials used for the Tipo’s cabin is average at best. There are one or two nicer plastics, but most of them are hard and scratchy. Overall, there’s a bit of a mismatch with the materials. We like the soft plastic that coats the dashboard, but it’s contrasted with harder surfaces. The climate controls – which have come from Alfa Romeo – look fab, the Tipo’s cabin is ergonomically sound, but the car lacks the premium feel that rivals do well. Not all models get the brands UConnect system but it really benefits the ones that do, allowing you to pair up your car with your phone so that you can stream music and check social media on the go. A 5” touchscreen is a bit modest but it’s easy to use. Is the Fiat Tipo Hatchback practical? This is where the car’s real strength lies. It’s a very affordable and practical family car which offers excellent visibility, lots of space and a good amount of storage solutions so that you can keep it clean and tidy. Fiat claims there is actually as much as 12-litres of storage solutions on offer. Head and legroom are fine throughout the car and the rear seats are comfortable. The middle seat is the least comfortable, but on shorter trips it should do for most adults. The boot, meanwhile, measures 440-litres. Standard kit across the range is decent. The entry-level model comes with a DAB radio, remote central locking, Bluetooth, front electric windows and chrome door handles. The Easy model gets Fiat’s UConnect infotainment system, electric rear windows, 16” alloys, LED daytime running lights, front fog lights and rear parking sensors. The Lounge model tops the range with automatic lights and wipers, a rearview camera, more chrome and a TomTom sat nav. Safety wise? Disappointingly, the Tipo scored three out of five for its crash test performance, scoring especially poorly for child occupant protection. Both that and its 3/5 safety rating is alarming, but it’s worth mentioning that if you specify autonomous emergency braking, its safety rating improves to 4/5. Prices for the new car start out from £13,800 and rise to £19,800 For more information on our leasing deals, you can check out our page here. In terms of its running costs, the petrol engines are fairly expensive to run and for that reason will probably only appeal to lower mileage drivers. A 1.4-litre 94bhp engine is the cheapest to run and can return 50mpg economy while emitting 132g/km of CO2. A 118bhp variant of the same engine is good for 46.9mpg and emits 139g/km. It does, however, cost £2,000 more than the 94bhp variant. A 1.6-litre petrol engine sits at the top of the range and returns 45mpg. Visibility is good, there’s as many as 12-litres worth of storage on offer, and the boot measures 440-litres. Even the entry-level model gets the likes of chrome door handles, remote central locking and a digital radio. With prices starting out from less than £14,000, it’s hard to find many cars that offer so much value at this price point. Both the Skoda and the Ford that we compare it to below are much cheaper to run. We described it as “not too shabby” earlier – which is a backhanded compliment if ever there was one. Let’s see how the car fares against its rivals in the comparison section of our 2018 Fiat Tipo Hatchback review. 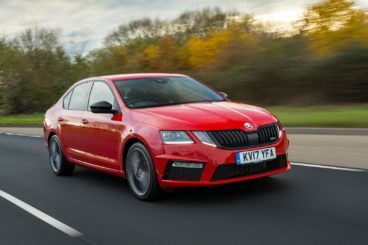 The new Skoda Octavia Hatchback is spacious, affordable – and even a bit elegant. The Octavia has shed a bit of weight from its bulky frame and can now boast improved handling. That said, while it’s good to drive it’s not what we’d call fun to drive. For that, you’d need to check out the Ford Focus. Its steering is well weighted if a tad unresponsive, and it’s not as communicative as we’d like. There’s a significant amount of body roll as well, but grip is plentiful. Ride quality is a major plus, with the Octavia able to smooth out most surfaces. In terms of its engines, a 1.0-litre TSI petrol unit sits at the bottom of the range but has an impressive 0-62 time of 10.0 seconds. It’s smooth but does need to be worked hard, and is best suited to the towns and cities. A 1.5-litre TSI engine is your only alternative petrol. It develops 148bhp, can do 0-62 in 8.0 seconds and feels nice and fast. It’s also quiet, while fuel consumption isn’t too much of a problem thanks to the fact that Skoda has added cylinder-activation technology. This allows the engine to return almost 58mpg while emissions are at 113g/km of CO2 if you stick to the manual gearbox. Adding the automatic transmission will worsen those numbers but not by too much. The smaller petrol engine, meanwhile, is good for returns of 62mpg and emits as much as 106g/km of CO2. Inside, the Octavia’s cabin is well-built, smart and comfortable. It’s not quite as quiet as a Volkswagen but insulation is respectable, especially with the petrol models. Design-wise, the Octavia is a little understated. It’s got lots of quality but it lacks imagination, and this can put some buyers off. There’s plenty of tech onboard, however, including an 8” Bolero infotainment system that’s compatible with Apple Car Play. If you want, you can upgrade it to a 9.2” Columbus system. Is the Skoda Octavia Hatchback practical? Its 590-litre boot is the biggest in this class. Fold the rear seats and you can extend it to 1,580-litres, and if that’s not enough you can upgrade to the Estate variant. What we love about the Octavia is the clever practical touches it has, such as a 12v power supply, shopping bag hooks and bright lights in the boot. Other than that, there are lots of storage solutions, including a big air-conditioned glovebox, while rear seat leg and headroom matches that in cars from the class above. 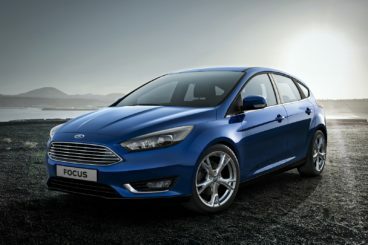 The new Ford Focus continues to be what it’s always been; a family car that’s fun to drive, efficient and comfortable. Perhaps the car’s biggest problem is that it seems to look dowdier with each passing year. Its image certainly can’t match its sharp driving experience, and the Focus remains the most fun car to drive in this class. Its controls are responsive, its gearbox is positive (if notchy), and its steering is as sharp as ever. The car’s suspension setup has also been tweaked so that it corners with more agility. If you love driving and if this is a priority of yours, the Ford is the one to go for. In terms of its engines, the one we’d avoid is the smallest petrol. It develops just 83bhp, and is way underpowered for this car. A 1.0-litre 123bhp EcoBoost turbo petrol is a highlight, but if its 0-62 time of 11.2 seconds isn’t good enough for you, the 1.5-litre 180bhp EcoBoost petrol covers the same distance in just 8.8 seconds. Running costs? The 1.0-litre EcoBoost turbo petrol is available with either 123bhp or 98bhp and both variants return 58.9mpg at best and emit 110g/km of CO2. Meanwhile, the bigger 1.5-litre EcoBoost engine is available with either 148 or 180bhp, and both variants can manage 50.4mph on good days while emitting 128g/km. 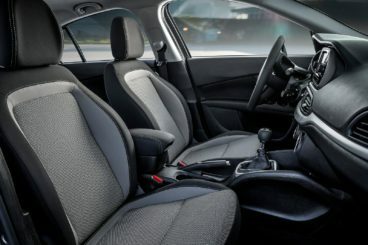 Inside, seat and wheel adjustability and padded seats ensure you’ll be comfortable in the Focus, while plush leather seats come as standard with the higher-spec models. The cabin, on the whole, is well built, and buyers will be pleased that Ford has now added silver trim to break up what was an otherwise sombre atmosphere. There’s a mix of soft and hard plastics on display, but overall quality is decent. Is the Ford Focus practical? Its 316-litre boot is way smaller than the Fiat and the Skoda, and this could prove to be a major deal breaker. Fold the seats and you can extend it to 1,215-litres, while it’s also worth mentioning the flat boot floor and the wide opening tailgate. At this point, some buyers will already be put off and it doesn’t exactly get much better. There’s plenty of room up front but rear seated passengers get a bit of a raw deal on the legroom front, while visibility is pretty poor. Still, there are lots of storage solutions here and there, and front and rear parking sensors are available as an optional extra. Back from the dead (okay, the eighties), the Tipo is the Bravo’s replacement. It’s not exactly great timing from Fiat, as the car is up against so many formidable rivals. As well as the Octavia and the Focus we just reviewed, you can also take a look at the VW Golf, the Vauxhall Astra, the Kia Cee’d – and more. 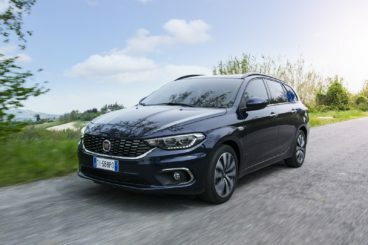 Has the Fiat Tipo Hatchback got what it takes to stand out? If a value for money means a lot to you, we’d say that it has.